Nutritional Content - Calories: 85. Protein: 2 grams. Fat: 7 grams. Fiber: 1 gram. “Net” Carbohydrates: 2 grams. Begin by pre-heating the oven to 250° F. Lay 2 sheets of nori side-by-side on a large cutting board. Lightly spray or “paint” water on the sheets – just enough to make them slightly sticky, but not enough to turn it back into soft seaweed. Sprinkle the dampened nori with salt. Cover the damp, salted Nori sheets with the 2 remaining dry sheets so that the two sheets fit directly on top of each other. You should now have 2 nori “sandwiches”. Use a pizza cutter or sharp knife to cut the two double-sheets of Nori into square or rectangular chip-sized pieces. You can multiply the amounts in the recipe to make a larger amount of chips. In a small mixing bowl, add your wet ingredients (olive oil and Tastes Like Honey). Stir until combined. Use a pastry brush to apply the honey-olive oil mixture onto the surface of the nori pieces. Lightly dust the painted nori with the Asian seasoning and pat on the sesame seeds so that a generous amount will stick. Place in the oven for about 15 – 20 minutes. The Asian seasonings I used in this recipe were basil, cayenne pepper, coriander, garlic, lemongrass, onion, paprika and white pepper. The blend is traditionally used to flavor duck, fish, pork, poultry and vegetables. In the context of this recipe, it imparts a multidimensional flavor profile which melds beautifully with the sea-like notes of the nori. The idea of eating crisp seaweed as a snack food may seem quite foreign in more ways than one. Coming from an Italian-American background, no one knows this more than me. 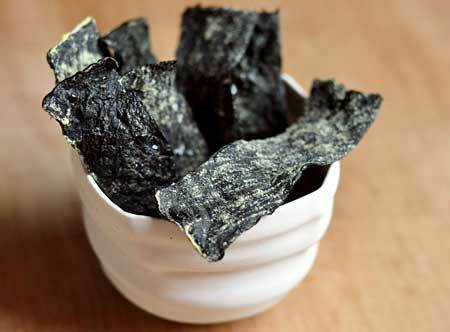 But trust me when I tell you that these savory-sweet nori chips have now secured a regular spot in our kitchen pantry. We keep them on hand for ourselves and for surprise guests. However, the reasons run deeper than just the great taste and the nutritional merits of replacing potato chips. Adding ethnically diverse foods to your culinary repertoire helps to keep your diet interesting. Simply put, pumping up the flavor quotient and variety in your meals and snacks is one of the best recipes for long term dietary success. I must try this. A good way to include some seaweed in the diet. I hope you enjoy it, Sue! I am anxious to get to try this treat! My wife is not into seaweed, but who knows once she tries it? Thank you for exercising your creativity in new recipes! I hope you’ll get the chance to try it and that both you and your wife enjoy it!